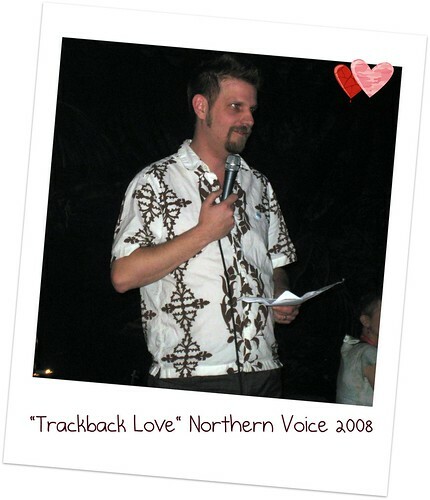 At the Northern Voice Tiki party, Scott Leslie wowed us (well I was wowed) with his rendition of a poem only geeks could grok, called “Trackback Love”. I grabbed some video with my little Canon Powershot- the lighting is awful but the audio is not bad. OMG, that had me ROTFL and brought me to tears. BRILLIANT!!!!!!!!!!!!!!!!!!!!!!!!!!!!!!!!!!!!!!!!!!!!!!! Very very funny!!! Thanks for posting. *clap*clap* The more I hear about NV the more fascinated I become with the lot of you all. Haha, I was there, and I can honestly say that that was one of the first poems I truly enjoyed! Geek culture rocks! I was definitely wowed, this was a Scott Leslie classic. I think “trackback love” was hysterical, and it needs to be noted that Scott quickly had a restless room (a result of all the god awful poetry that came before it) eating from his hand given a masterful delivery. OK, wow, this is glorious. What a lesson: always, always, always have your camera-with-video with you. This clip not only is, but *should be*, a persistent resource. 6 months later and it still makes me laugh. I’m so glad you recorded this! @Jen: Hee- and I am glad someone still peeks back at old posts! Credit of course goes to Scott’s creativity. Great NV08 memories….